Ben Braga, the president of the International Committee for the 6th World Water Forum and the vice president of the World Water Council, talks with Circle of Blue about the Forum next week, the Rio+20 Summit in June, and solutions to the world water crisis. Ben Braga is president of the International Committee for the 6th World Water Forum, vice president of the World Water Council, and professor of civil and environmental engineering at the University of São Paulo, Brazil. Less than a week before the French city of Marseille hosts the 6th World Water Forum (March 12-17) — the triennial global convening of water professionals, politicians, business leaders, international organizations, scientists, and the public to tackle all things water — the United Nations announced that the international target to halve the number of people without access to safe drinking water has been met ahead of the 2015 deadline. But the U.N. tempered the news with a warning that meeting the Millennium Development Goals on sanitation is largely offtrack. Circle of Blue spoke with Ben Braga about the upcoming 6th World Water Forum, which vows to be the global convening for solutions and commitments. 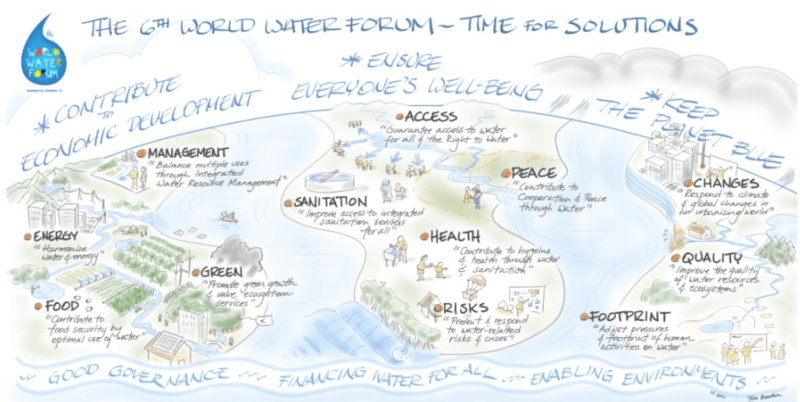 Circle of Blue: What can we expect from the 6th World Water Forum compared to previous forums? Ben Braga: This Forum intends to be a little bit different from the previous ones, in the sense that we have prioritized the actions on the ground that look for solutions to water problems in different areas. The focus is not so much on discussing, making diagnoses, or trying to understand the problems, which is what we mostly did in the previous [Forums]. Of course, in the previous ones, we also had some actions that resulted in interesting initiatives from different levels of government, but, in this one here, the novelty – if we could call it that way – is that we will be focusing more on the solutions to water problems, be they technical or institutional, or legal, or [related to] governance. These solutions will be from different stakeholders, either from governments or the private sector, or the NGO community. Can you give us examples of something innovative that will come out of the Forum? Ben Braga: One of the priorities that the Forum’s committee has established is the harmonizing of water and energy. Another is promoting green growth and value ecosystem services. For example, in the latter, there is a target to propose a framework for action on green growth and water by the end of 2012 that supports the implementation of the Rio+20 agreements and that [takes into account the 6th World Water Forum’s] political declarations. The Forum committee is working very closely with Rio+20 to bring these commitments into the Rio Summit Declaration, even though our Forum declarations are not binding, because we are not a governmental organization. We try to influence governments to make commitments themselves. That’s why the Rio+20 Summit is so important to us – we want to introduce water [to government leaders] at the Summit. More and more people are looking at the intersections of water with energy, food, climate, and other critical resource issues. Has this framing changed what you, as an organization, and organizers are doing? Ben Braga: This is interesting. It started with the people who work on water supply and sanitation. They were saying that one of their biggest costs was associated with the energy used by water-producing systems. And then it has evolved into water needed to produce energy and energy needed to produce safe drinking water. Now, if you ask me whether this has changed our way of thinking, I don’t know. It makes it more systemic, which is interesting. But we have always been concerned with water use efficiency, with using renewable energy sources, et cetera. So it’s just making it more systemic. From March 12 through 17, water experts will be convening at the 6th World Water Forum in Marseille, France, to seek solutions to 12 priority water targets that can be seen in the diagram above. You’ve described the 6th World Water Forum’s goals as those of solutions and commitments. What concrete actions and commitments can we expect from the event? Ben Braga: There is an expectation that [the Forum will] advance transboundary river basin management. There is an article in the Forum’s ministerial declaration that incites ministers to look more closely at the issue of transboundary river management. There is another article about the recognition of water and sanitation as a human right. You know that the U.N. General Assembly passed a resolution on this, but it is not binding. We are trying to see if, in our declaration, governments can be more specific about these two very sensitive and very important issues in the water sector. How do you plan to keep the momentum after the event is over? Ben Braga: This time, we have a platform on our Web site, called Solutions for Water, which will be kept after the forum is over and will be carried on by the World Water Council. Anyone who has access to the Internet could submit a solution [in that platform] to the targets listed on our Web site. So far, we have collected more than 1,000 ideas to achieve those targets. Our idea is that this platform will [continue to live after the Forum], and we will use it as a follow-up to the commitments that have been made during the event. We will use it and maintain it [so that we could] keep this momentum forward to [the 7th World Water Forum in] Korea. What other water priorities would you like to push forward at the Forum and in 2012? Ben Braga: Looking at the water problems around the world, my feeling is that we need to find a way of financing the least developed countries, to allow them access to safe drinking water and sanitation. I think the Millennium Development Goals for sanitation are appropriate. The problem is that achieving this goal requires a lot of financial and human resources – you have to increase the capacity of local people to operate the systems after they are implemented. So there is a need for the more developed countries to find some win-win formula. I think that, from a humanitarian point of view, this is one of the very important issues that I, as a citizen, would like to see fulfilled. 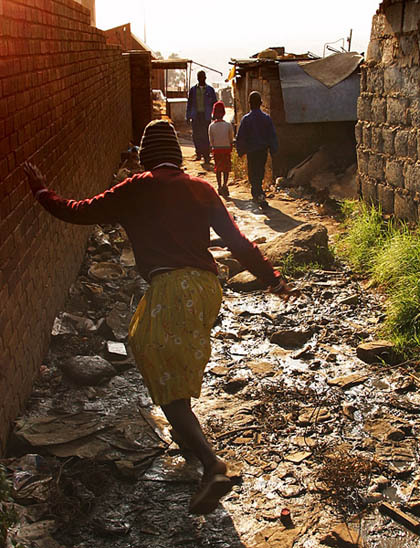 Residents of Johannesburg’s Alexandra Township gingerly step across flows of raw sewage in September 2002, while delegates to the World Summit on Sustainable Development in South Africa met across town to discuss global sustainability challenges. Ten years later, just a few months before the next Earth Summit in Rio de Janeiro, Brazil, the U.N. still warns that meeting the Millennium Development Goals on sanitation is a long way off. In the course of the preparation for the Forum, have you seen any promising ideas or innovative ways to address this? Ben Braga: For example, the National Water Agency of Brazil uses subsidy mechanisms to give financial resources to municipalities to construct sewage-treatment plants. But instead of just providing the funds to the mayor, the National Agency first estimates the amount needed to construct the treatment plant. This amount stays in a savings account at a national bank, which guarantees that the money is going to be given to the municipality when the sewerage-treatment plant is in operation. When people hear about this, they say, “Ah, but this is so obvious! So, why didn’t you do it before?” It is a very interesting way of giving the money, but — at the same time — you can only tap it when the sewage-treatment plant is in operation. If the municipality does not have the money [for the upfront investment], they can borrow at any federal institution at a very low interest rate, so they can construct and launch the plant. This will reduce, first of all, corruption, because the mayor would want to have the treatment plant constructed at the lowest cost; if the national agency estimated a certain amount, and the mayor can construct it for less, the surplus will go to the municipality, and he can do more. So it will also avoid projects that start and don’t finish, which is very common in less developed countries. This [financing mechanism] is already in operation in Brazil, and it has served more than 7 million people. So it’s not just an idea that will have to be carved and worked a lot. It’s ready. And countries in Africa or Southeast Asia could use the same procedure to increase the treatment of their effluent and increase the quality of their urban rivers. We’re already seeing systemic global impacts caused by water scarcity, pollution, and related challenges. What is the tipping point that will cause government and business to move from incremental to transformative actions? What do you see as the next catalyst for the water agenda? Ben Braga: Things are changing and will change in a moderate pace. I think those tipping points are complicated. The political class is becoming more aware of environmental problems [in general]. Now they are getting more interested in water specifically. My feeling is that this is going to change gradually. And what is really important is the gradient, not the instantaneous value. It’s the fact that the gradient is positive. You see more and more mayors caring about serving the population with better water and treating the effluents from domestic systems. In the past, they were just concerned with constructing the systems to collect the sewage. Why do I say it’s gradual? Because the mayors and the prime ministers have other areas that they have to put their financial resources in – schools, energy, transportation, housing – so it’s always a matter of where the financial resources go; that’s where the priority is. So I think that is changing. It’s not changing with the pace we want it to, but it’s the gradient that counts. The developing world is now, and will be for a couple of decades to come, spending £billions or maybe £trillions on coal fired power stations. And who can blame them, with 40,000 people per day dying from preventable diseases, for the sake of affordable energy and potable water? Coal fired power stations use and contaminate vast volumes of fresh water to cool the waste heat from the steam turbines used to generate electricity. This heat, containing nearly two thirds of the heat from the coal, is truly wasted. In the 50s and 60s, whilst the UK trod a path to a nuclear technology dead end, the US Administration withdrew funding to technological development of Molten Salt Breeder Reactors (MSBRs) in what is surely the ‘Saddest Accident of History’ ( http://lftrsuk.blogspot.com/2012/03/follow-up-to-i… ) . MSBRs, now known as Liquid Fluoride Thorium Reactors (LFTRs), use gas turbines to drive the electrical generators and the ‘waste’ heat from these (just over half of what the reactor produces) is at a high enough temperature to desalinate water. So, nothing is ‘wasted’; huge volumes of potable water can be produces from brackish ground water or sea water – and the cost is NEXT TO NOTHING. The Heads of State of the developing world need to urgently liaise to get the first-of-a-kind LFTR up and running, for a piddling amount of money. This will get investment stimulated to the point that venture capitalists and fund managers are knocking the door down to get into the most essential technology of the 21st Century. In the days of slide rules and compasses, when all machining and planning was done manually, the Molten Salt Reactor Experiment (MSRE) was funded in 1960, switched on in 1965 and ran for many thousands of full power hours until 1969. The MSRE was two thirds of what a LFTR is, so in these days of CAD/CAM, computerised 3D modelling and planning, with the right will, a LFTR could be ready for action in 5 years. Within not much more than a decade, we could have factory built, transportable modular units coming off production lines. Their safety is inherent and their ‘greenness’ unrivaled. See:http://lftrsuk.blogspot.com/p/benefits-of-lftrs.ht… .